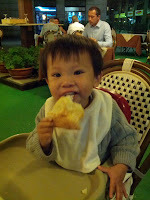 I promised myself that I would blog about my trip to Italy before November but I never really got the chance to do it. There just never seems enough time to get things done. The days went by quickly and 2012 is almost done! I began writing this post in my head last night, as I was trying to fall asleep (one of a few free time that I have these days). I had gone over more than 1500 photos that we snapped in Italy last month, but I never got to finish the caption until now. Browsing through those pictures again reminds me of how enigmatic but forever amazing and beautiful Italy is! This island city is by far the most unique city we'd ever visited. Surrounded by water, there's no lawn and no paved streets for cars. The walkways narrow to arm's width and they all look similar in every other way. There are a lot of bridges connecting the islands. The street signs exists but sometimes are very difficult to find, adding to the likelihood that visitors regularly get lost; which my mom actually got lost on the day we arrived around 1am! My sister and Choon Ping went to look for her for sooo long... finally she found her way back to our apartment 2 hours later! My mom noted that she'd never crossed so many bridges in her entire life and she's pretty much done with Venice after such long night walk! It actually gave us a different experience of how Venice was like with not much tourists around, especially the Piazza San Marco. To our surprise, Venice is pretty safe late at night. While planning our trip, my Italian friend expressed their love of Firenze, and this great city did not disappoint. Our apt was just right at the center of the town! It's just one block away from the Piazza della Signoria. Basilica di Santa Maria del Fiore was just down the street. The architectural wonder was so grand that it couldn't fit inside the frame of our camera. We had 5 days here. So we took our time to visit Uffizi Gallery, strolling along the beautiful Arno River toward Ponte Vecchio, lining up to Accademia de Galleria to see the actual "David", Checked out Palazzo Strozzi, visited Palazzo Pitti, and Boboli Garden. 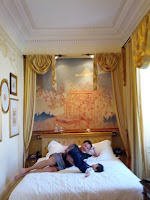 On the last day at Firenze, we took a day trip via train to Lucca and Pisa; which was a bit tiring. Lots of walking involved and by the time we were about to leave Pisa, it was about to get dark. More and more mosquitoes... they were all very aggressive! When we got back to our apartment, we realized that the fruits that my mom bought for Wy at the farmer's market at Lucca had "disappeared" (stolen)! We had a total of 5 days here in Rome. But my mom and sister had only 3 days. It was quite rush for them. Our 2-bedroom apartment was surprisingly spacious; just 5 mins walk to Colosseum! Love the fact that we got to admire the Colosseum by night everyday on our way back to our apartment! Walking around Italy was like having the volume turned on your day. Almost everywhere was a bit louder and crowded with tourists. Rome was definitely no exception! Lots of car traffic, which Wy liked it a lot as he got to watch those vehicles constantly zooming by. Funny that we realized in Rome, all the motorized vehicles would not stop for pedestrian even if it's on a zebra crossing. BUT they would all stop if pedestrian with kids, babies or strollers crossing the road! 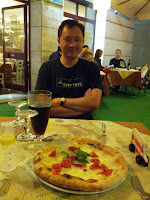 The following day was another full day... we took subway and then walked to the Vatican City. Musei Vaticani (Vatican Museums)... what can I say. I could not believe how detailed every inch of the place was. Pretty much everything in this complex is a work of art. No photos are allowed inside the Sistine Chapel where the frescos of Creation of Adam, the Last Judgement, etc resides, so we have only the memory of seeing it. Even though the security guards kept saying “silencio” (silence) to the people in the chapel, and “no photo!” People were still chatting away and some took photos when they were not looking. Wy pooped in the Chapel, and it was a big one... it was quick stinky that we’d to change his diaper in there as once we got out of the Chapel, we couldn’t get back in anymore. It’s like a ‘one way traffic’. After visiting Musei Vaticani, we entered Piazza San Pietro. The crowd was ridiculous. The line to enter the basilica wrapped entirely around the piazza, so we decided not going into the basilica. On our way walking from Vatican to Piazza Navona exists my favourite geleteria in Rome. :) YUM! Our final stop for the day was the nearly 2000 year old Pantheon. The next day, we took the bus up to Anacapri; a more local, quieter town, and located on a much higher elevation. The buses were not very big and got filled up very quickly. The bus ride to Anacapri was a hair-raising thrill ride. The bus drivers were a bit crazy here, fast speed on a super narrow road and steep cliff along the way! If heights don't make you sweat, stand on the RIGHT side of the bus going up, and LEFT side leaving Anacapri. The panorama view of Capri will take your breath away! We also visited Villa San Michele, and I did some shopping before getting the bus back down to the main area of Capri for dinner. :D The relaxed pace and sunshine had made it a great last 2 days in Capri! We then got the Funicolare back down to the Marina, and back to our hotel. We took a boat tour around the island in the morning the following day before we left Capri. Lucky for us, Wy fell asleep within 2 mins after the boat started moving! And he stayed asleep the entire ride. :) Too bad that we’d to skip the tour to famous Grotta Azzurra. The wait was just too long (2hrs! ), and we’d a little man with us! :( After the tour, we had lunch at the Marina Grande, and then we took a ferry to Naples where we simply stayed overnight and catch an early flight the following morning. 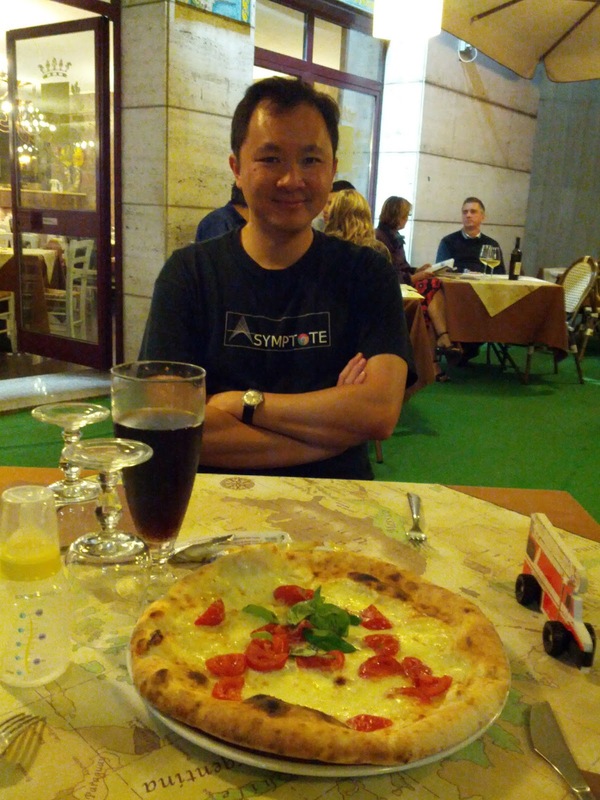 Naples was pretty ghetto, but they had yummy pizza! We highly recommend Italy as a vacation for all our family and friends. Visiting museums and churches in Europe with just the two of us and a baby/toddler? Forget it! It's not going to work... at least for us. I am thankful that my mom and sister came along to join us. The trip would never be the same and we would have never made it to all those places that we'd been! ...and we got to have a little romantic getaway. A simple idea and the best kind of fun!! Oh yeah! The shopping in Italy was simply to die for!! Thanks for reading this outdated trip posting. Hopefully you are able to experience Italy in some other way, even if only vicariously. Ciao~!